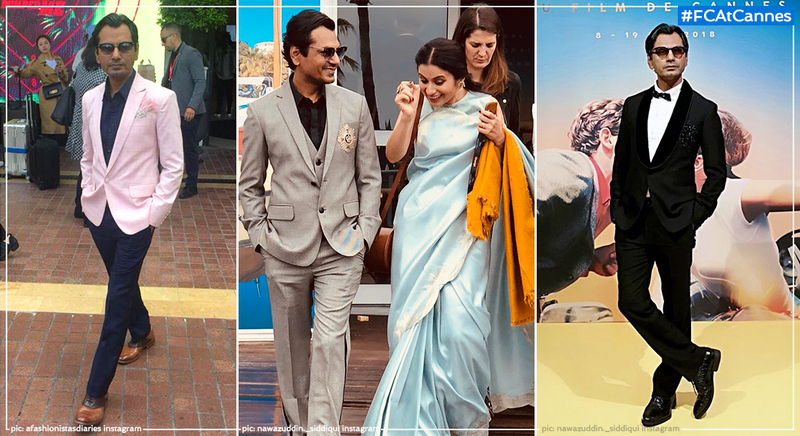 Before Nawazuddin Siddiqui left for the screening of his film Manto at Cannes, he bid farewell to his trusty suit. It had served him well through three years of red carpet events at this very Mecca of film of festivals. He could’ve borrowed a leaf from Susan Sarandon’s book. In 1978, at Cannes, Sarandon managed to convince a waiter at one of the famous restaurants to part with his jacket — she looked impossibly cool in it too. Well, it looks like Siddiqui just missed a chance at making pop culture history. Bollywood-favourite Manish Malhotra came to his rescue this year. The designer kitted him out with a wardrobe to cover his entire stay in the sunny French Riviera. Boy, that must feel nice! Siddiqui was spotted in a pastel pink jacket, which he teamed with a navy shirt and trousers. A grey three-piece suit with embellished patchwork details. He ended on a high, wearing a black tuxedo with velvet lapels. Sonam Savlani writes on fashion, lifestyle and culture. Her work has appeared in the Indian editions of Vogue, ELLE, Harper's Bazaar and Grazia.